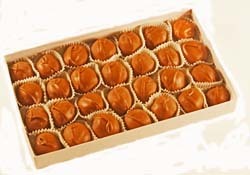 Dorothy's artisans create peanut butter cremes from our own secret recipes, then drench them in Dorothy's unique Swiss chocolate recipe. This piece has been a best seller at Dorothy's for years. If you love peanut butter, this delicacy is sure to please.